Mr. Potter: Just remember, if you're not one up on the other fellow, then he's one up on you. Terry-Thomas at his caddish best! I first saw this film about ten years ago and in that time I must have seen it two hundred times.It stands for everything great in British comedy.It tells the story of a young man who always seems to come a cropper in the lifeman stakes.He joins classes for one-upmanship and turns into an arrogant idiot. 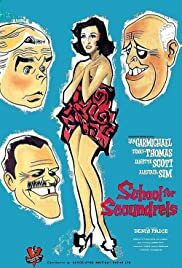 Alastair Sim is at his lugrubious best.Terry-Thomas plays the bounder to a tee with some wonderful lines.If I have one gripe it's the casting of Ian Carmichael in the lead role.Leslie Philips would have been much better But that's a personal choice. Now I'm off to watch it again for the two hundred and first time!